Merging data from multiple Microsoft Excel worksheets or CSV files using simple Drag&Drop. No need for complicated macros and formulas. 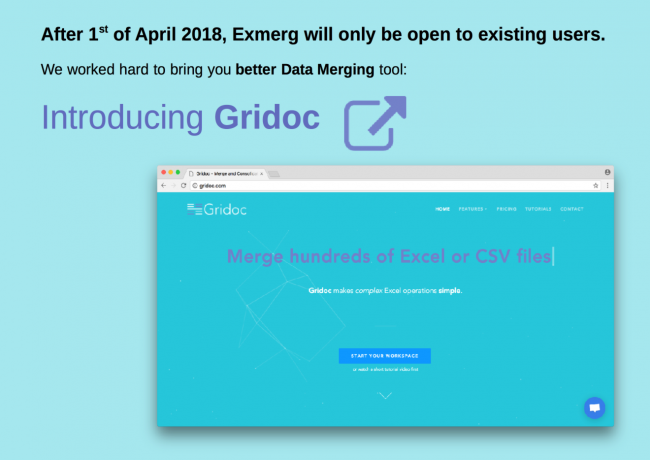 EXMERG is online productivity tool for merging data from multiple worksheets or CSV files using Drag&Drop. You can combine tables into single master table or merge data by custom rules, all managed by simple and easy to use user interface. Merge data spread across tens or hundreds of files. Create rules to join tables from different files and discover relations in your data. Detect duplicates or extract unique values using Drag&Drop. Get interactive insight into your data with dynamic charts. Simply drag your Excel or CSV files to the browser and have them processed. Make selected files available for your co-workers, or share whole workspace. Download results or save them into your workspace for later. EXMERG is an application for merging and consolidating data from Excel workbooks or CSV files. It transforms data into comprehensible structure and makes it easy to quickly perform tasks which could otherwise take hours. We deeply respect the trust of our users who upload their precious data into our service. One of our main tasks is to make sure your data are protected and stored in highly secured environment. There is no 3rd party access to your data, ever. We carefully use sample data from our users to test algorithm improvements. Where can I submit bug or feature request? Please use our issue tracking system to submit bug or feature request. Do you offer enterprise version of EXMERG (hosted in private network) ? If customer requires complete control over the server which runs EXMERG, there is an option to have it installed into private enterprise network. The other possibility is private cloud hosting, in which EXMERG instance runs in the cloud, but with special setup which guarantees exclusive access for the customer. For more information please contact service@18.220.176.218. Needing to merge four exported CRM csv worksheets, it was a daunting task and I would consider myself a power Excel user. Excel seemed to make it harder than it needed to be so a quick browse and I came upon Exmerg which brought together the fields easily. A quick “concatenate and sort” afterwards and I saved hours of painstaking copy and pasting. Thanks! Really love that the site is user-friendly and easy to use but yet is really powerful under-the-hood! The tool was exactly what I needed! It worked flawlessly and was extremely easy to use. Thank you! I’ve always struggled with how to merge multiple Excel files into one without resorting to some sort of statistical program like SPSS. Your website did the job BEAUTIFULLY. I bookmarked it and will be returning the next time I need to do something like that.